Weed is a small city midway between Portland, Oregon and San Francisco, and between Los Angeles and Seattle, Washington, on the I-5 corridor running north/south in California. Weed is officially recognized as part of the Volcanic Scenic Byway, a 500 mile route beginning in California’s Lake Amador basin and ending at Crater Lake in Oregon. The route traverses extraordinary scenery and geologic phenomena and links the four notable volcanoes in this part of the continent. 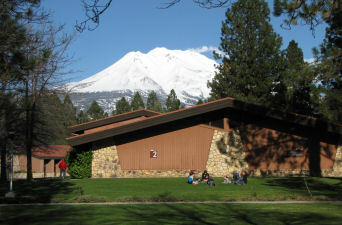 College of the Siskiyous, one of the most beautiful community colleges campuses in California, is located at the base of majestic Mount Shasta. This 250-acre campus is easily accessible off both Interstate 5 and Highway 97 in the town of Weed. There are more than 3,000 students enrolled at College of the Siskiyous. Facilities include student lodges, a 600 seat theater, football stadium, and a spacious library and media center, as well as life science labs, career & technical education and computer labs, and a number of general purpose classrooms. A staff of approximately two hundred administrative, instructional, and classified personnel help students obtain the best education possible. Exceptional successes by COS students have been achieved in music, drama, science, engineering, and athletics during the history of the school. The College is widely recognized for its excellent programs in the humanities and arts, sciences and technology, and in athletics. The setting, a natural environment of mountains, forests, lakes, and streams, serves as an outdoor workshop for many classes such as art, geology, the life sciences, and physical and recreational education. Opportunities for outdoor recreation and sports abound: hiking, camping, running, swimming, bicycle touring and mountain biking, rock and mountain climbing, hunting, fishing, and boating. Rafting and kayaking on nearby whitewater rivers such as the Klamath and McCloud are special attractions. In winter, there is superb downhill and cross-country skiing, as well as snowboarding on beautiful Mt. Shasta. Our Regional Information page links to several local places of interest. Student housing is available in on-campus lodges. Inexpensive housing is also available off-campus and in nearby communities. Graduates repeatedly express their feelings regarding their experience at College of the Siskiyous in terms of the warmth and friendliness of the staff and the provision of quality instruction in a caring atmosphere. Four distinct seasons delineate the year in Weed. Summer’s heat is partially alleviated by the prevailing south winds. Average daytime temperatures range between 80 and 90 degrees, and there are periodic thunderstorms. Nights often cool into the 50s. Autumn weather can set in as early as Labor Day, and the winters are dry but sometimes snowy. Daytime winter temperatures average in the 30s to 40s, drop-ping to the mid 20s at night. Springtime is often short, the last frost sometimes coming as late as Memorial Day. Weed’s elevation is 3,500 feet, and its growing season averages 100 days. The city is listed as a USDA Zone 6, and as Zone 1 in Sunset Magazine. Siskiyou County covers 6,287 square miles of forest, high desert, and mountain terrain. Although clustered for the most part in small cities and towns throughout the area, the 44,300 Siskiyou County residents have plenty of elbow room. Approximately 3,300 people live in Weed, with an estimated 7,000 more people living in the surrounding unincorporated area. The city is home to people from diverse ethnic heritages living, working, schooling or retiring in a warm, small town culture in natural striking beauty and spaciousness. For more information, visit the Weed Chamber of Commerce. The mission of the Siskiyou Association of Realtors is to provide resources and education to promote proficiency, professionalism, and ethics among its members. To promote and maintain high standards of conduct in the real estate profession as expressed in the Code of Ethics of N.A.R. Copyright © 2019 Siskiyou Association of Realtors, all rights reserved. Area photos by Steve Lewis. Website by Silver Rockets.